The North Coast Environment Council congratulates Luke Foley on his Great Koala National Park plan. “ If we want to save the koala from extinction, we have to save the forests that are their home,” said NCEC spokesperson Susie Russell. “The Great Koala National Park would be a strong foundation for a new approach to managing our public forests. The priorities have to be maintaining healthy populations of our unique animals and plants and caring for our water supply catchments. “Koalas populations are crashing across their known range. The previously largest known population in NSW in the Pilliga forest has all but disappeared. 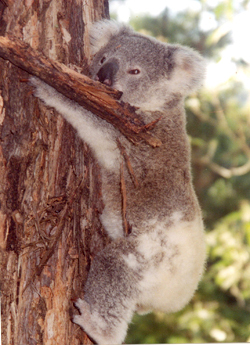 The koala populations of the north coast are among the largest remaining. Koalas are recognised by both Federal and State laws as being vulnerable to extinction. “A major reason for this is the ongoing destruction of their habitat. There is a competition for trees bigger than you can wrap your arms around (30-80cm diameter). The koalas need them and the loggers want them too. “Which is more important: Healthy koala populations or hardwood floorboards? “Which will bring more economic benefit to the region: Visitors to see koalas, walk the park trails, stay, eat and shop in the local area- or dozens of log trucks carting away the future?” she asked. “NSW is at a crossroads, if we keep propping up this heavily subsidised logging industry, we could lose the koala from the wild. “The current Government promised before the 2011 election, that it was going to do something to protect koalas. The koalas are still waiting for whatever that is to happen. “Meanwhile the Baird Government is slashing the logging licence conditions, that will see even less effort to protect endangered species such as the koala, and open up steep areas of forest that were protected since major landslips occurred in the early 1990s. “The Great Koala Park announced today as a key election promise by Luke Foley, would be a connecting corridor of forest from the coast to the escarpment. It would also protect the forest proposed for a radical new type of clearfell cable logging on extremely steep slopes. “It was 20 years ago that Bob Carr promised to protect oldgrowth forests….maybe Luke Foley will be able to do the same for the koala,” Ms Russell said.